function, an iPod would charge when not being used. The Mini was upgraded to Mini+ in 2012.
the front of the speaker or by the new well designed and simple to operate remote. however this could also be used in the original Mini and fitted directly into the iPod dock. red and black. White followed within 12 months. existed to use either a wired or wireless network. Quite innovative at the time this AktiMate model attracted huge publicity and like its predecessor, it was the recipient of awards in many countries. performed at its best when making use of an Ethernet (wired) option. with a choice of music as the ‘wake up’. And so it went on. that rather than replace this model, an entirely new product would be designed with completely different technology options. being the key component, the original Micro was designed to target that market. It didn’t mean however that they should be limited to desktop use! 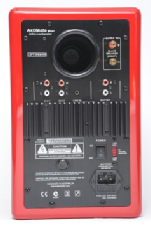 speaker as with all models, a 40W Class D amplifier was housed in the active speaker. TheIPod dock was positioned on the top of the active speaker. 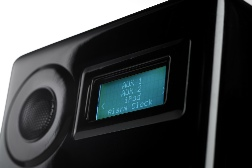 The incorporated universal power supply meant that the speaker s could be used anywhere in the world without need for a change in voltage selection.The On/Off switch is located on the rear panel of the active speaker and a blue LED lights above the volume knob when the system is on. This was followed by a Group Test in the same magazine where our AktiiMate™ Micro was the outright winner beating some serious opposition. 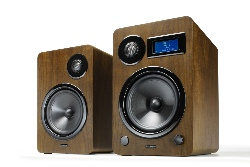 The speaker then went on to win the Desktop Product of the Year in What Hi Fi in the UK. Whilst some subtle changes occurred along the way with the introduction of a metal grille over the woofer and the addition of a Bluetooth adaptor, the speakers did not received a major upgrade until development of the Micro B some two years later.